National Women Physician Day will be taking place on February 3. ABIM wants to celebrate the female physicians who are part of our diplomate community, governance team and staff, — as well as all the women physicians who are making a difference in medicine around the country. This blog post spotlights one of the many inspiring women on ABIM governance. Dr. Green is Associate Professor of Medicine and Medical Education and Senior Associate Dean for Medical Education at Northwestern University Feinberg School of Medicine. She is certified in Internal Medicine and lives in Chicago. Dr. Green is a member of the ABIM Board of Directors and the ABIM Council. I have always found the science behind human health and disease to be fascinating. Combining my ongoing curiosity with the privilege of hearing the stories of my patients that are communicated honestly and directly to me—as someone who is trusted to listen and care, is really the most wonderful work that I can imagine. It seems obvious to me now, but always ask the patient what they are worried about. The answers often surprise me and have made me recognize that our perspectives as physicians, about what patients need and think, are often wrong. It is our obligation to hear the voices of our patients, not only in the exam room but also when making policy decisions about health care. Mentorship is a big part of my job. I once supervised a resident in his longitudinal outpatient clinic. When he started, he had some professionalism problems. Our relationship was not initially easy, as he was not open to feedback; however, I was able to recognize that his arrogance was really a lack of confidence. Over time and with support, our relationship became a partnership between learner and teacher, and by the time he finished residency, he was one of the most confident, compassionate and outstanding patient care providers that I have known. Helping someone who starts as a superstar and ends as a superstar is easy, but it is much more gratifying to know that my guidance may have helped someone who was initially struggling become a truly outstanding physician. When I see patients in the office, there is often raw emotion expressed in the exam room. Sometimes it is sadness, but often it is laughter. Being able to model that kind of communication to my students and residents is so important. I also have a pretty insatiable curiosity. Every patient encounter offers something new to learn about. If my students learn to be a bit more curious and a little more comfortable being real with a patient, I have made an impact not only on their professional happiness, but also on the care of their future patients. Being a physician is an incredible privilege, but also a responsibility. We, as doctors, are obligated to remain competent in our knowledge skills and attitudes in a world where health care is changing and patients are more informed. As physicians, we are not good at recognizing our strengths and deficits. I wanted to be part of an organization that can help physicians keep up in a meaningful way, and reassure them that they are doing so as they work to maintain their certification. Physicians should feel proud about being board certified, and patients should feel confident that the care they receive from a board certified internist is positively different. What didn’t you know before joining the ABIM Board of Directors and the Council? Perhaps this will display an embarrassing ignorance, but I didn’t truly understand the purpose of parts of Maintenance of Certification (MOC). I, like many others, felt that there were hoops to jump through to maintain my certification, but they did not resonate with me. It wasn’t until I became part of the organization that I understood that the purpose of MOC was about keeping up with knowledge and improving practice. ABIM has done a much better job in the last few years of communicating with physicians, but it still has a way to go. Fortunately that is now a key mission for the organization. I know that ABIM is working hard to instill pride in its program and to its members once again. 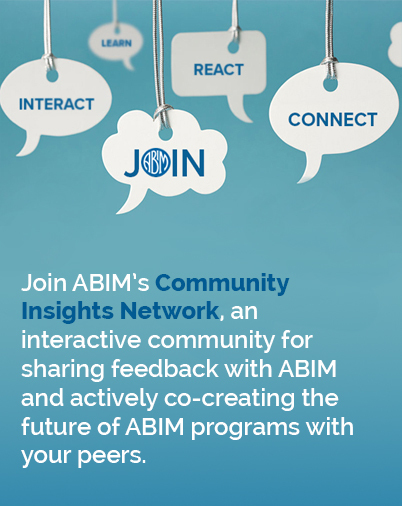 What did you learn about joining the ABIM Board of Directors and the Council? I’ve learned how much work and thought goes into the development of each and every question on the examinations. Everyone takes the job of creating a program that resonates with physicians and demonstrates excellence to both the physicians and the public very seriously. I’ve also met physicians from all over the country who practice in a variety of health care settings and who are helping to make a difference. The best thing about serving has been the people I have met and being able to play a role during a critical time for ABIM. It’s a challenge because I, like everyone else, want to see change happen rapidly, but if we don’t do it right and listen to all constituents, we risk the ultimate mission of professional self-regulation in service to our patients. So, while I am a “get it done” kind of person, I have learned that patience and listening are essential. Some of the most important voices are the voices of thoughtful dissent. ABIM needed to change and it has. The organization I joined a few years ago is not the organization it is today. It has been hard for people to see that and certainly hard to trust it. We’re now focused on doing a better job of communicating those changes. I grew up in South Florida as the daughter of a sailing biochemist. I spent many wonderful weekends and vacations anchored off the Florida Keys basking in the sun. I am grateful for dermatologists! Aside from medicine, I am also interested in watching my three daughters grow into the accomplished happy women that they are. While I feel very lucky to be able to practice and teach medicine, and I would encourage anyone to pursue this wonderful career, my biggest success in life is being a mom.